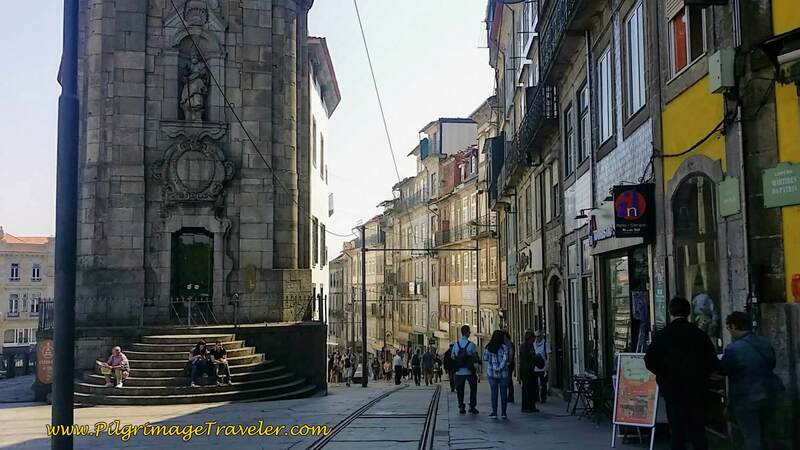 The romantic city of Porto, bustling with energy, has something for everyone; history, port wine, river walks, gorgeous views, azulejo-lined churches, forts, beaches, towers, friendly natives and great, inexpensive food. "People get bored everywhere but here. There's always somewhere to be, something to do and someone to see." 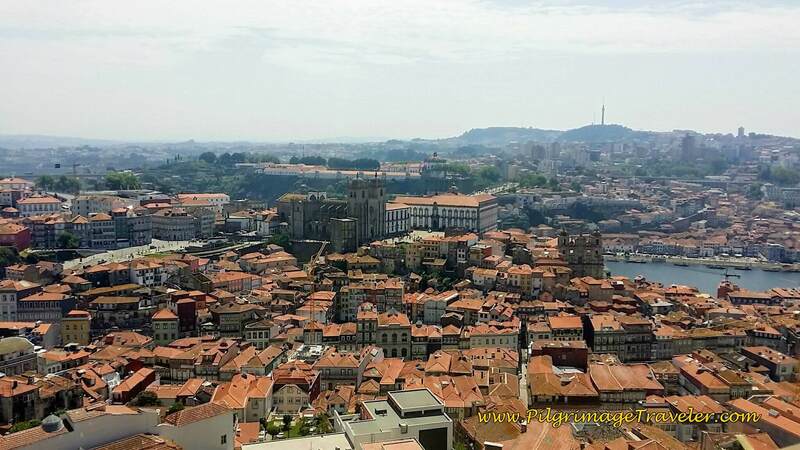 ~ Alex at Top Crush, 10 things that only the City of Porto can teach you. If you can spend a day or two, during or before your pilgrimage, you will not regret it. My only regret is that we saw very, very little of this magical place in just one day. But what a glorious day it was! 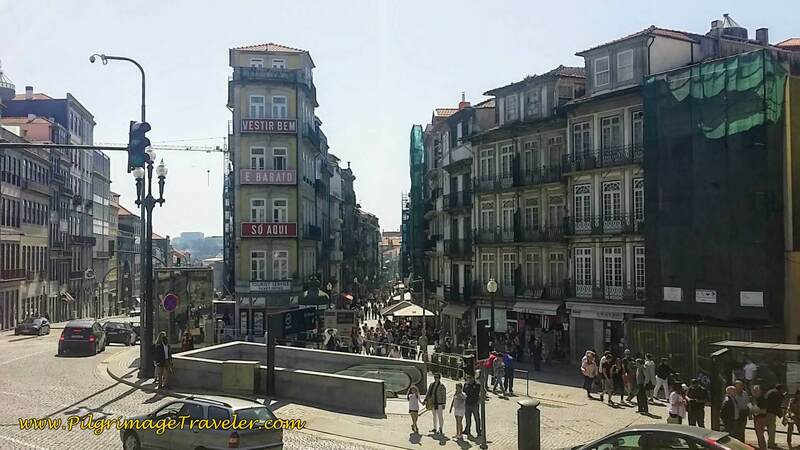 If you wish to have reservations in Porto, prior to your arrival, which may not be a bad idea in high season, click here. 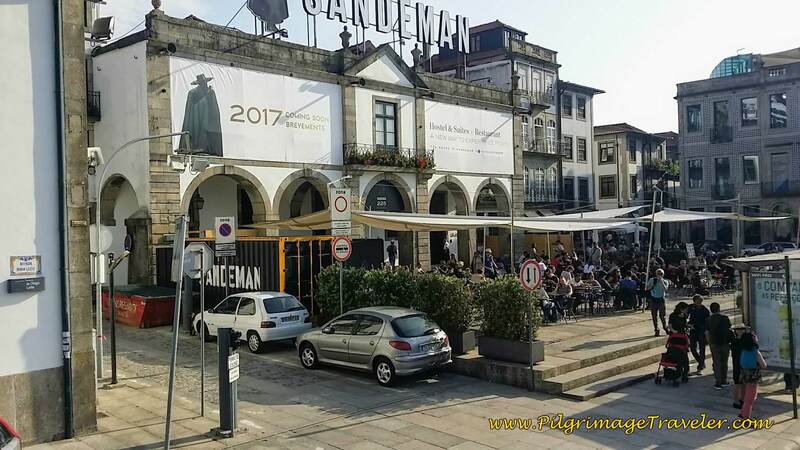 Because we had walked on day fourteen to Vila Nova de Gaia a southern suburb of Porto, we finished the final two kilometers of the Camino into town, early in the morning of the next day. 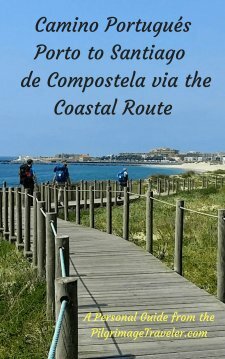 You can refer to the map from day fourteen (and more photos of Porto), to see how we walked here, if you are interested, by clicking on the link in this paragraph. You can see the early morning light, in the photo below, taken from the Ponte Luis I, from just down the hill from the cathedral. 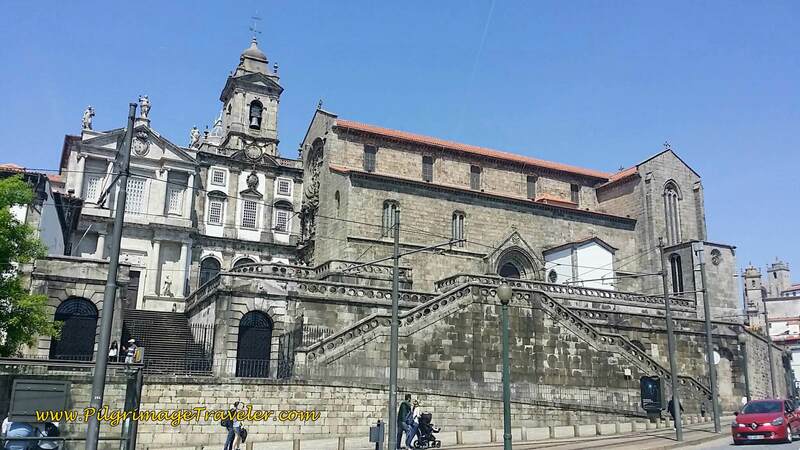 If you are walking from the center of Porto via the pedestrian bridge, this is how you will locate the Mosteiro da Serra do Pilar, the domed monastery. 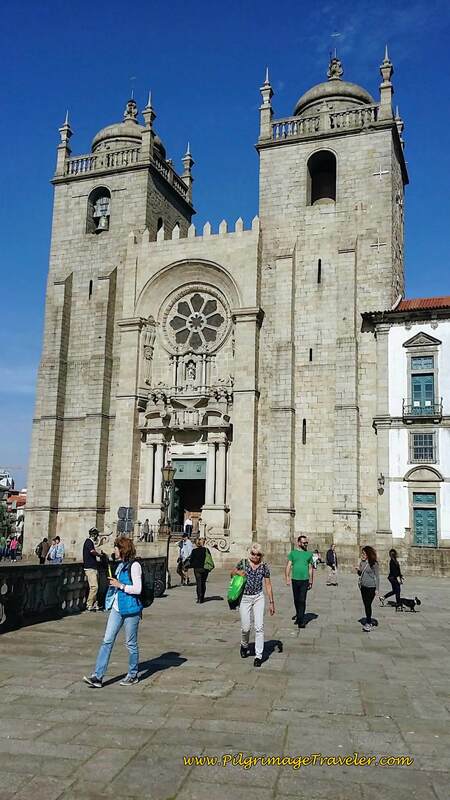 Or you can approach the monastery from the south on your final day into Porto, like we did. Climbing to the terrace of the Monastery is a grand introduction to this marvelous place! It is well worth the walk across the bridge to see this monastery, for the views alone! I am glad we did this first thing in our day in Porto. The light was perfect for photos! After crossing the bridge, look for the first street to your left, the Rampa do Infante Santo, shown below. The sign marks the way to the Monument. We did not even visit the monastery itself, but hung out on the terrace overlooking the city. 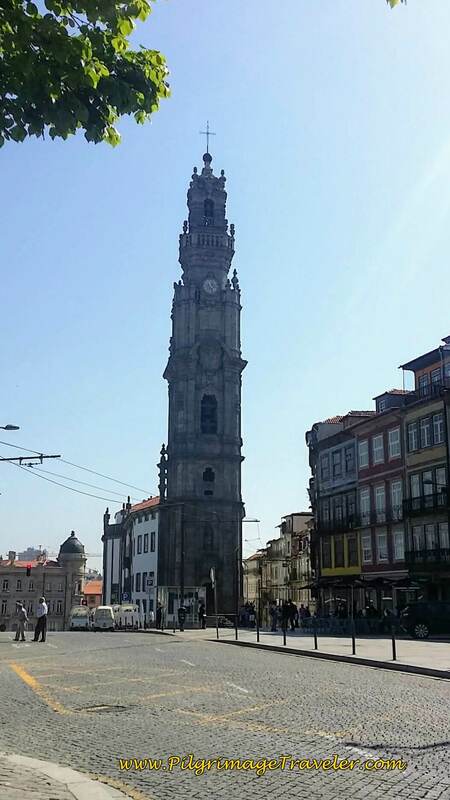 Our next destination was the Cathedral of Porto. We actually took a taxi the day before to see the cathedral. 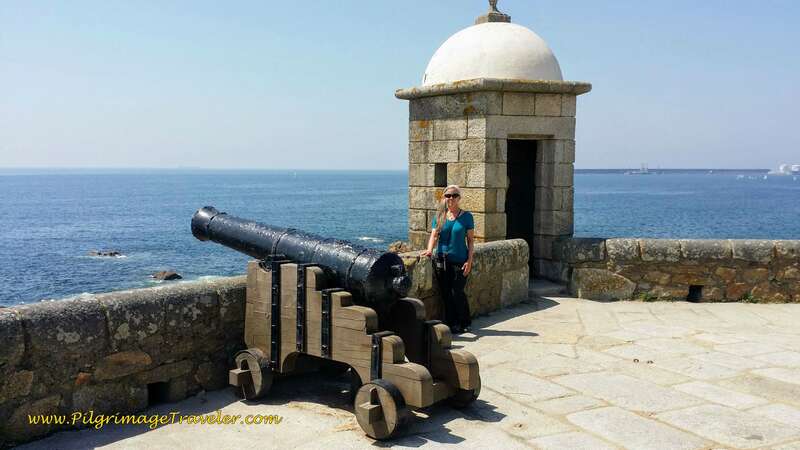 We had time on our day fourteen and wanted to take full advantage of the sights to see. 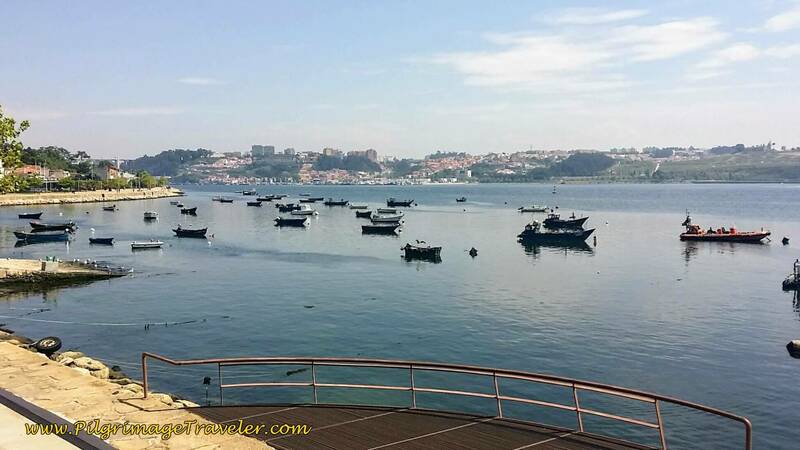 The Sé do Porto is the focal point of the town, and it too is on a terrace with sweeping views of the city. You can see the twin towers of the cathedral in the skyline photos above and from almost everywhere in the city. For all the information you need to know about this historic cathedral, click here for the official website. Depending on how much you love cathedrals, how many of them you have already seen and how long you intend to pray, you may want to plan on an hour here. You can pay an additional three Euros to see the cloisters, we which did not. Once we saw the interior, we were more content to sit on the terrace and people watch! 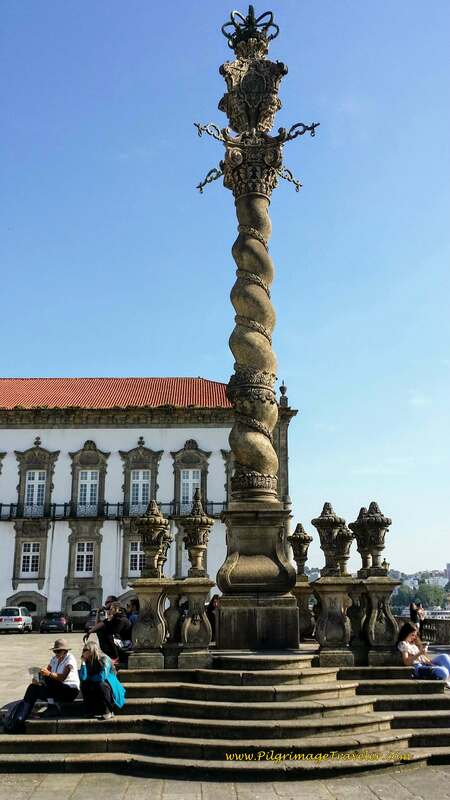 Just outside the main entrance of the cathedral, in the open plaza is the unique Pillory of Porto. It is of the manueline style, and I found conflicting information as to whether or not it was built in the medieval times. The legend says that medieval criminals were hung from this pillar. 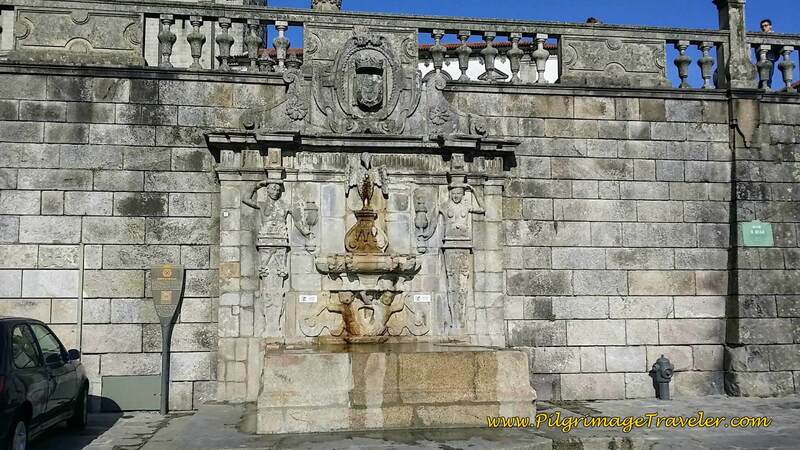 Just below the Cathedral's terrace wall, due west of the pillory, is a fountain, the Chafariz da Rua Escura. It is also known as the Pelican Fountain (Chafariz do Pelicano) as you can see the figure of a pelican in the center, top of the fountain. It also has two female figures on each side and the royal coat of arms. It was built in the 17th century, but moved to its current location in 1940. 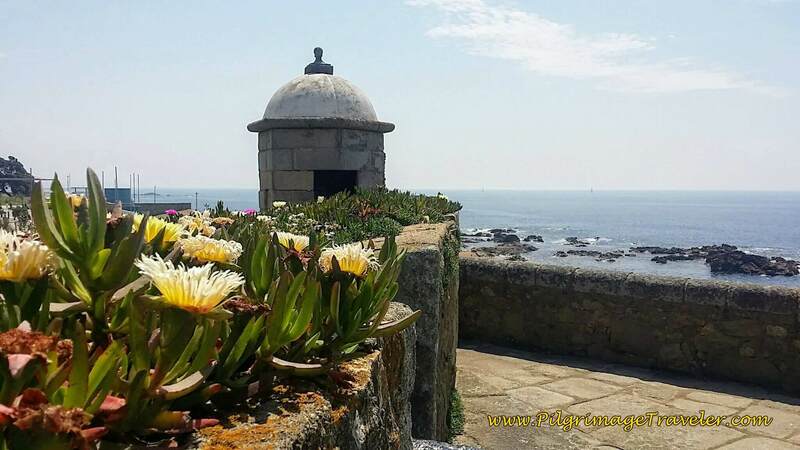 It may be worth your while to find this fountain as the Camino Senda Litoral (Seaside Coastal Route) and the Central Route both walk by here after beginning at the cathedral! After the cathedral, we opted to tour the rest of the city on the Hop On Hop Off bus. 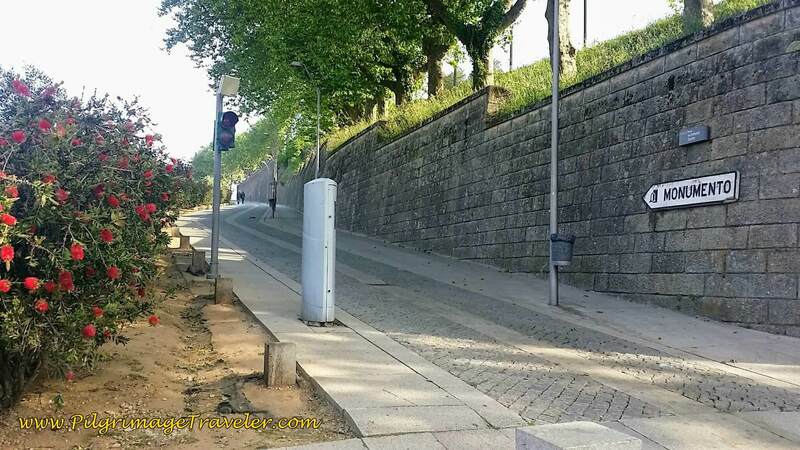 It was the most economical way to see Porto, without walking for many kilometers. We were ready to take a break from that! Our day in Porto was a glorious respite from walking. You can choose from the blue line or the red line, depending on what you wish to see. 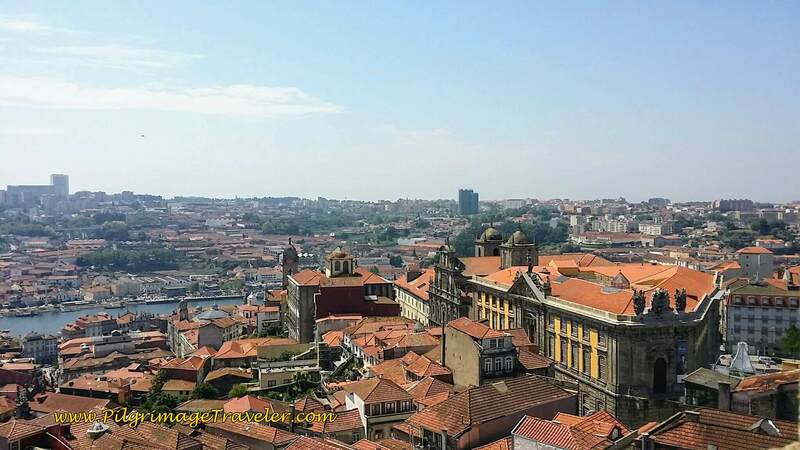 Click on the link above to plan your day in Porto and for current rates. We chose the one day option, but you can choose a slower pace and do the tour in two days. 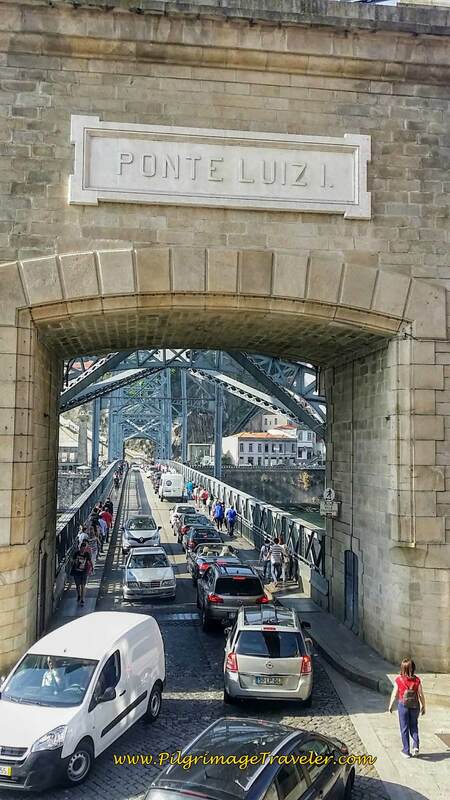 We rode the red line because it went out to the castles on the coast, the beach and the waterfront on the return, along the Douro River. 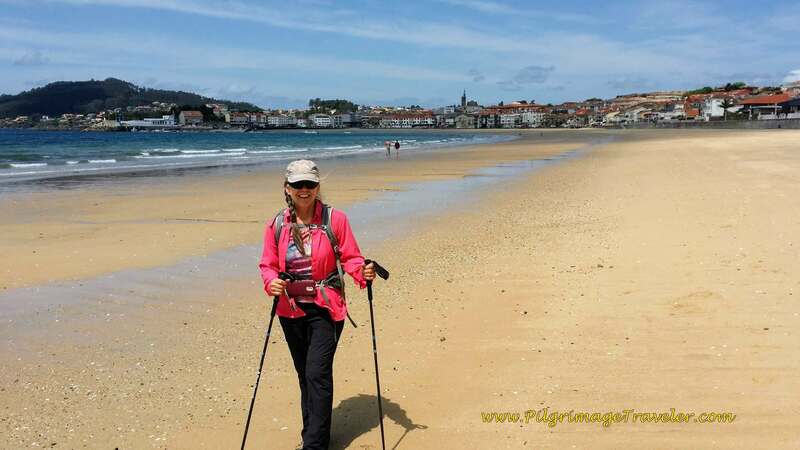 A nice preview of a portion of day fifteen on the Camino which we planned on the Senda Litoral! We also rode the blue line, when we needed a ride to our hotel in Gaia at the end of the day! So convenient! We first boarded the Hop On Hop Off near the Cathedral. It runs counterclockwise and we whizzed by the next two churches. 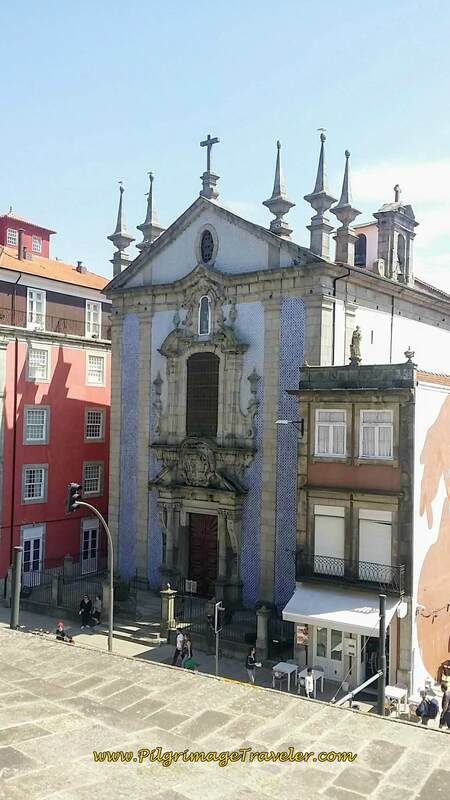 First the Baroque Church of Ildefonso, with its striking blue tiles. 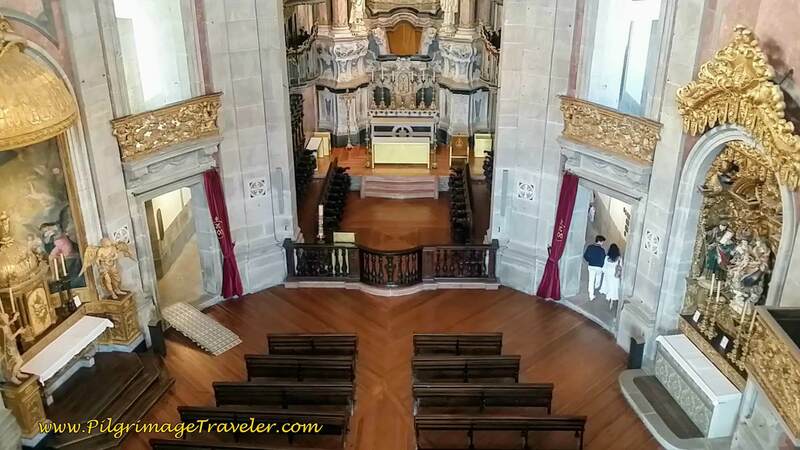 Sitting on the top, open air level, of course, the next church was the Igreja da Santissima Trinidade or the Holy Trinity Church. Neither of these monuments was on the list for scheduled stops, however a short walk will get you to the Trinity Church, behind the City Hall. 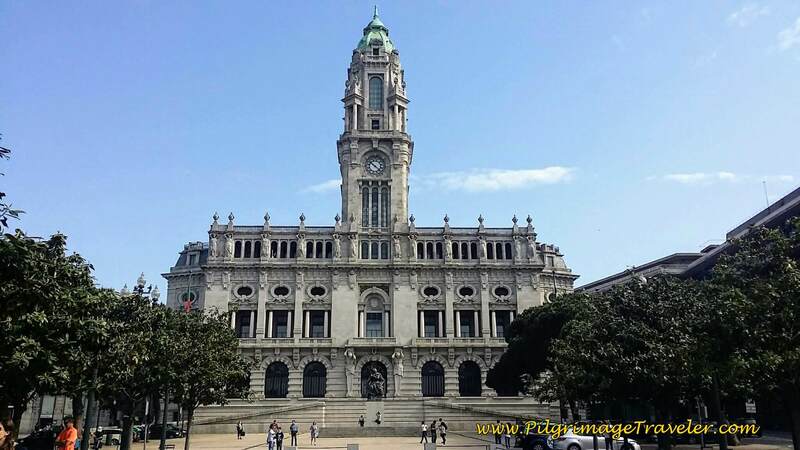 The first stop was at the Câmara Municipal do Porto or the City Hall, below. It is a grand tourist attraction with a lovely park and reflecting pool. Back on the bus, the next stop where we disembarked, was the twin churches of the Igreja do Carmo and the Igreja dos Carmelitas. 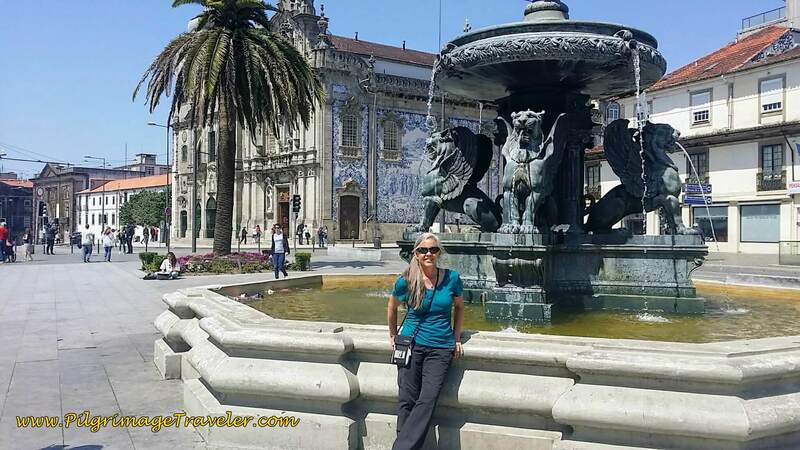 In the front of these churches is a fabulous plaza and the Lion's Fountain, the Fonte dos Leões. While I was fooled at first, thinking this was one church, it is actually two, built side-by-side! Lots of legends abound about whether the nuns and the friars were separated in this manner, one church for males and the other for females. Ha ha! 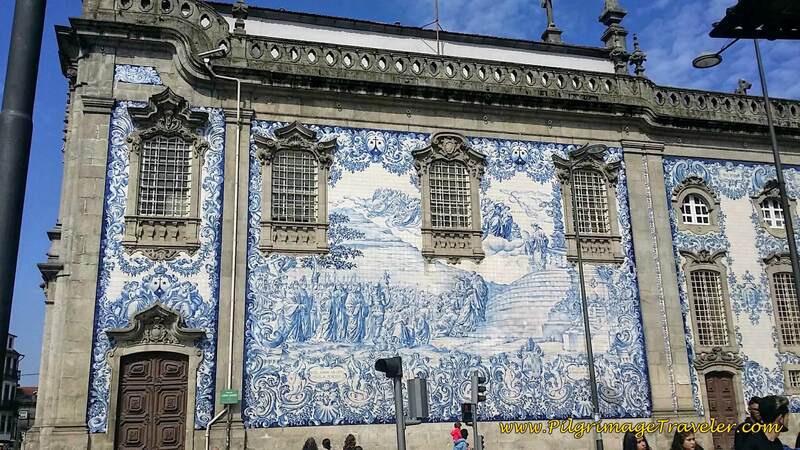 The well-known blue-tiled mural on the Igreja do Carmo is striking and is seen from a distance as you approach on the tourist bus. It was completed in 1912 by Silvestro Silvestri. 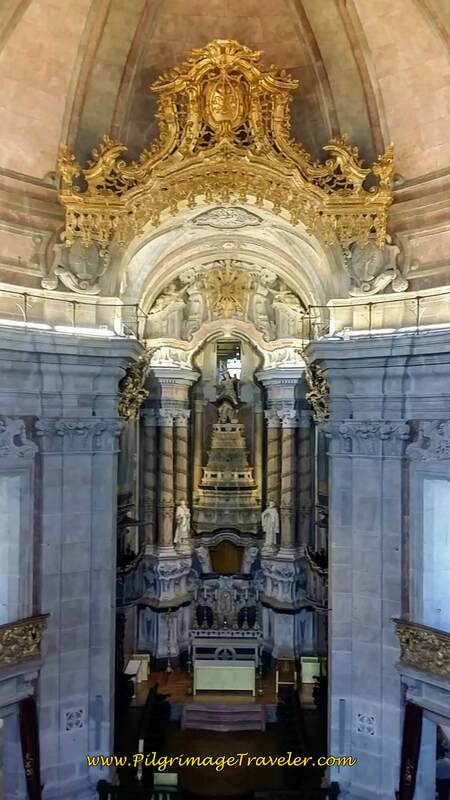 The Igreja do Carmo was built in the 18th century in the Rococo style and the Igreja dos Carmelitas was built 150 years earlier in the 17th century in the Baroque-influenced Classical style. 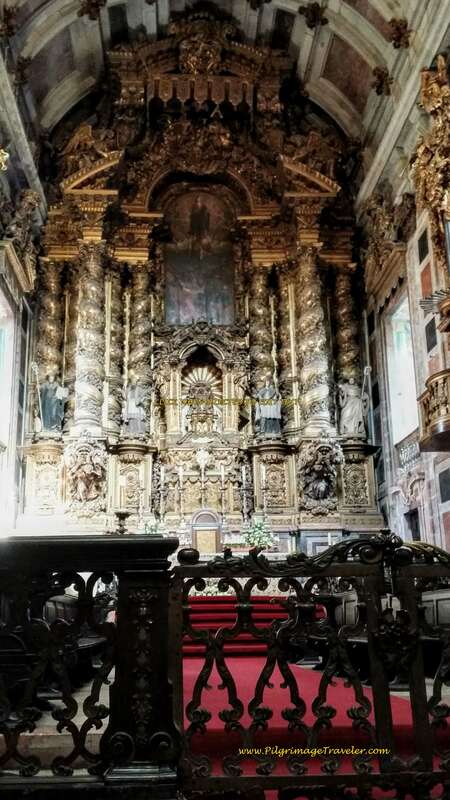 Both churches have altars carved in gilt, below. 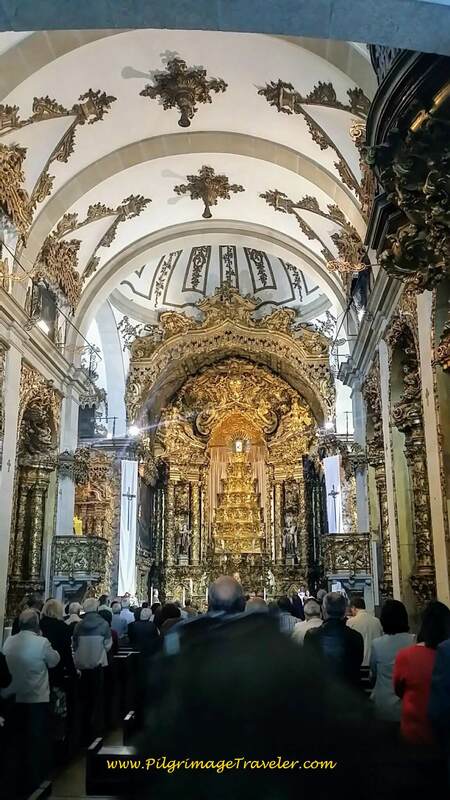 There was a mass going on in the Igreja dos Carmelitas on Sunday morning when we visited. Just across the plaza, the Praça de Gomes Teixeira, is the University of Porto, below. 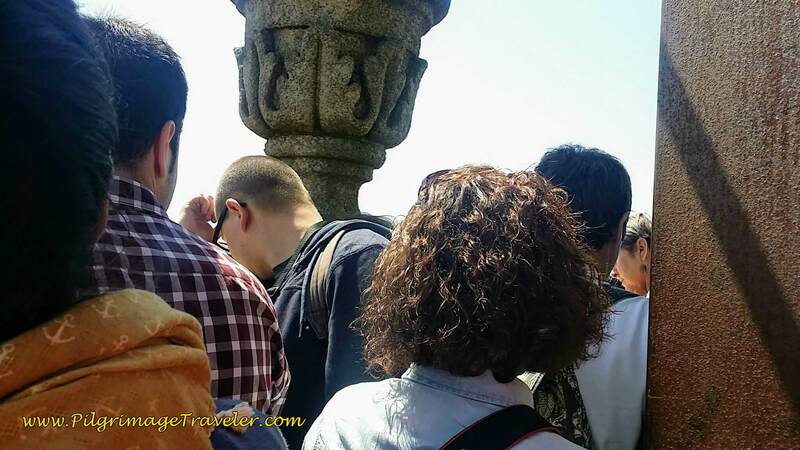 Instead of hoping back on the tourist bus, we walked south to see the university, and then through the park, the Jardim da Cordoaria, for only a few blocks toward the Clérigos Tower or the Torre dos Clérigos, one of the most famous sites in Porto and a priority on our list. This bell tower can be seen from just about everywhere in the city. In front of the tower, I just had to snap this photo, below, to show how popular is this site! The many ways to get around the city, all in one block! All that is missing is a taxi or a horse and carriage. 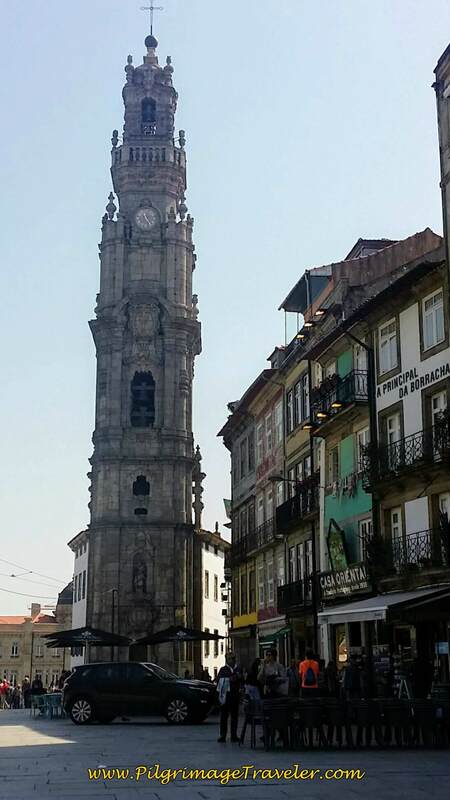 The history of the Clérigos Tower and Church, started by the Brotherhood of Clerics in 1754 is quite fascinating. 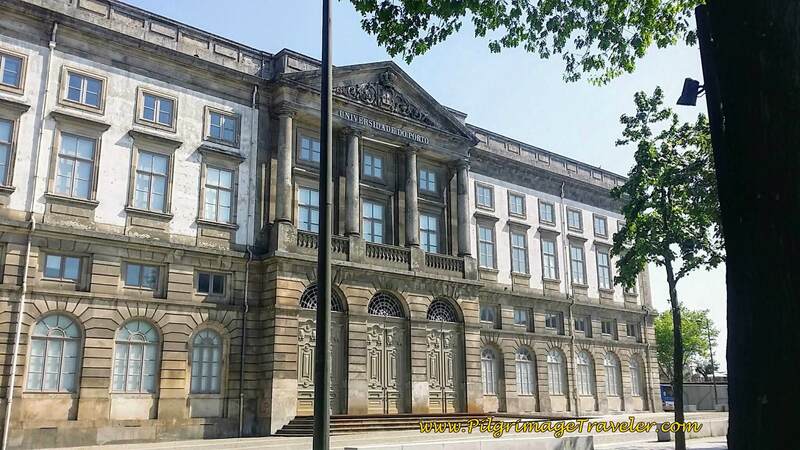 By 1910 this landmark building became a national monument, and in 2014 it opened a museum to the public. For all the information you need to know about Clérigos, click here. The street just to the south of the tower, the Rua da Assunção is quite inviting and has lots of shops and restaurants. 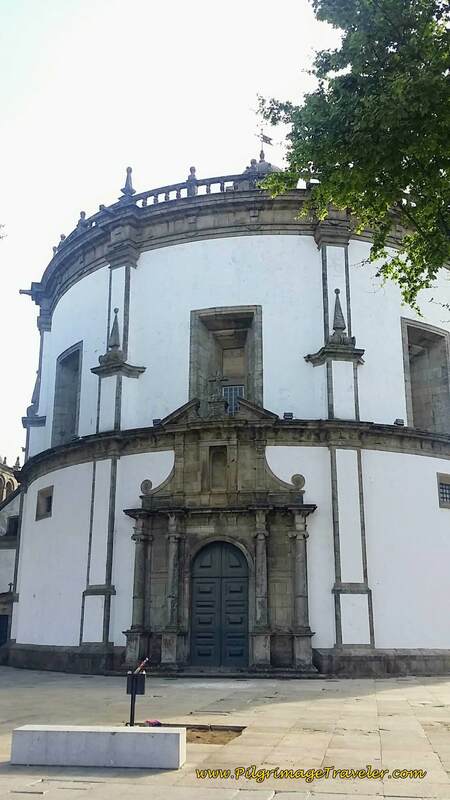 The Baroque-style Clérigos church or Igreja dos Clérigos, is rectangular which gives the sanctuary a feeling of intimacy, yet it is full of upper walkways and passageways. 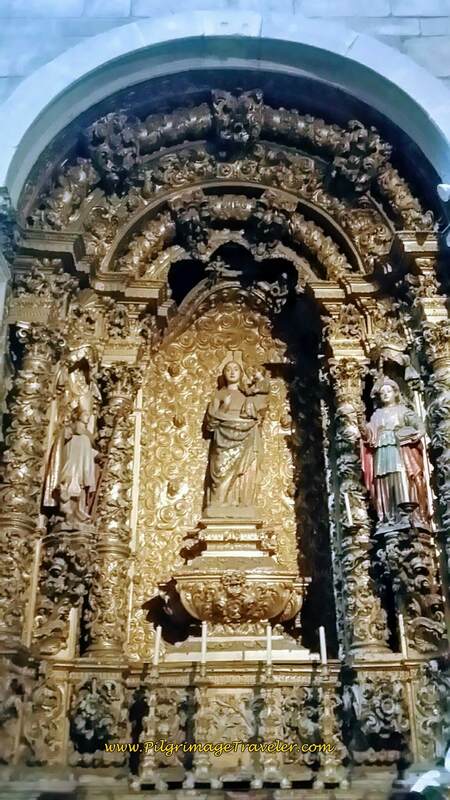 According to the official website, the "marble altar and a rococo-inspired altarpiece, with the design of Manuel dos Santos Porto, in which a throne crowned by the image of the Patroness, Our Lady of the Assumption, stands out. 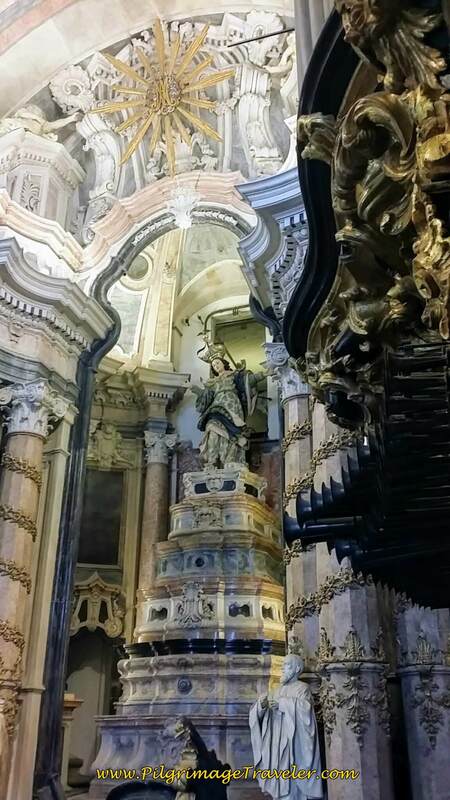 On the flanks of the altarpiece, the co-patron saints of the Brotherhood of the Clerics are highlighted, St. Peter ad Vincula and St. Philip Neri, two painted wooden sculptures." 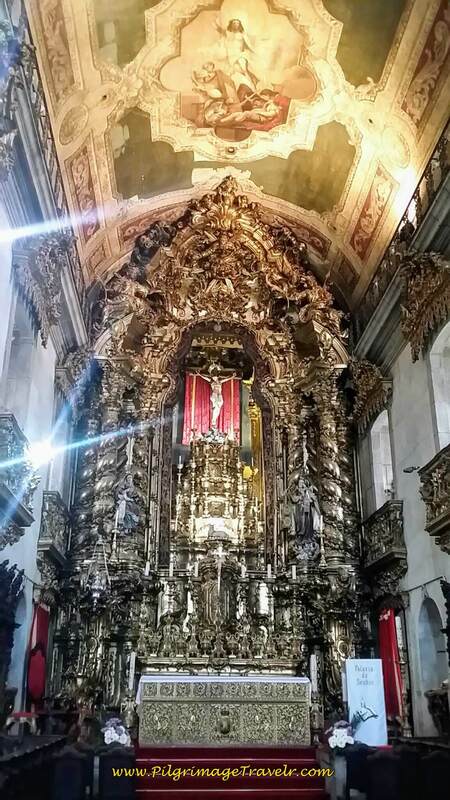 The Clérigos museum, not shown in any photos, is extensive and full of many sculptures, paintings, furniture, goldsmithery and the "Christus Collection" of various artistic and devotional depictions of Christ on the Cross. Many of these museum pieces were private, some from personal collections and most used in the daily life and worship of the Brothers of the Clerics. 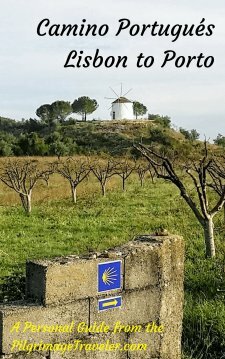 Plan on spending at least two or more hours on this site, especially if you plan to visit the bell tower, the most dramatic of the attractions. We waited for a very long time, in a very long line to gain entrance to this Baroque tower. Unfortunately, we were there on a Sunday, which may have made it worse. The tower is 225 steps up, and 75 meters high. It is worth the climb as the views are absolutely stunning as you can see below. The tower staff only let a few people in the tower at once, and though highly controlled, we still had to wiggle our way to the outside to see the view, and wiggle our way around to the 360 degree vantage points! If you need lots of personal space or are claustrophobic, better stay away! Just to the north of the Clérigos Tower is a plaza where we had a noon break at a café. 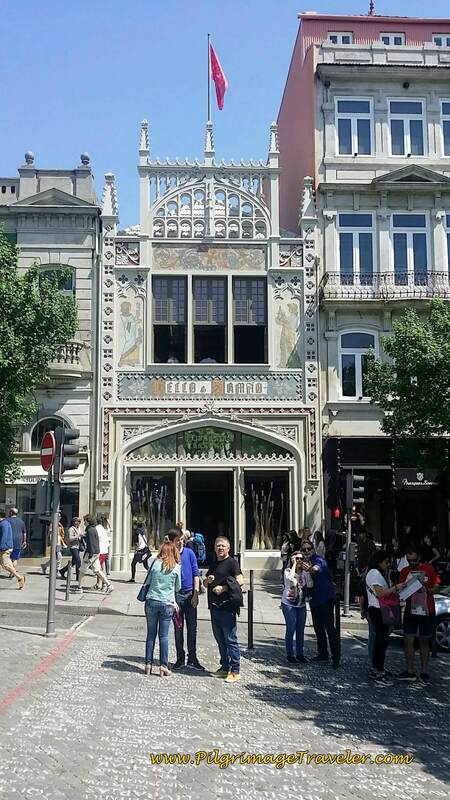 By our resting point was the famous bookshop built in 1906, the Livraria Lello & Irmão. It has some interesting architectural features, but due to its high entry fee and low priority on our list, we contented ourselves to admire it from the outside while we ate our lunch. The official site calls the Livraria Lello & Irmão the most beautiful library in the world, that inspired the author of the Harry Potter books. Click here for more information if you are interested in seeing it. 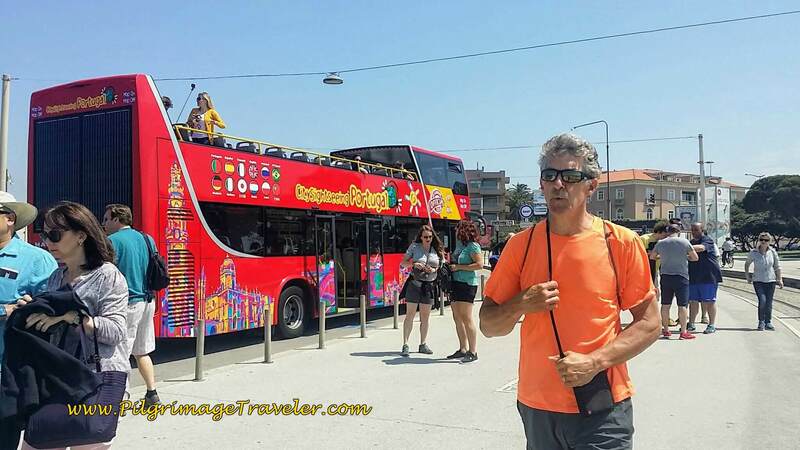 Our first move after lunch, being tired of monuments and museums, was to hop on the tourist bus' red line, west to the seacoast and the Castelo do Queijo. 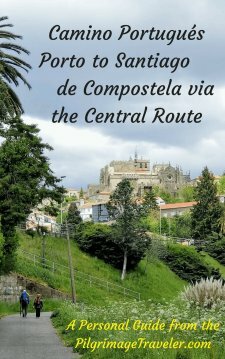 We were especially excited to see this portion of the bus route, as we would trace the Senda Litoral Coastal Camino, backwards from the Castle. 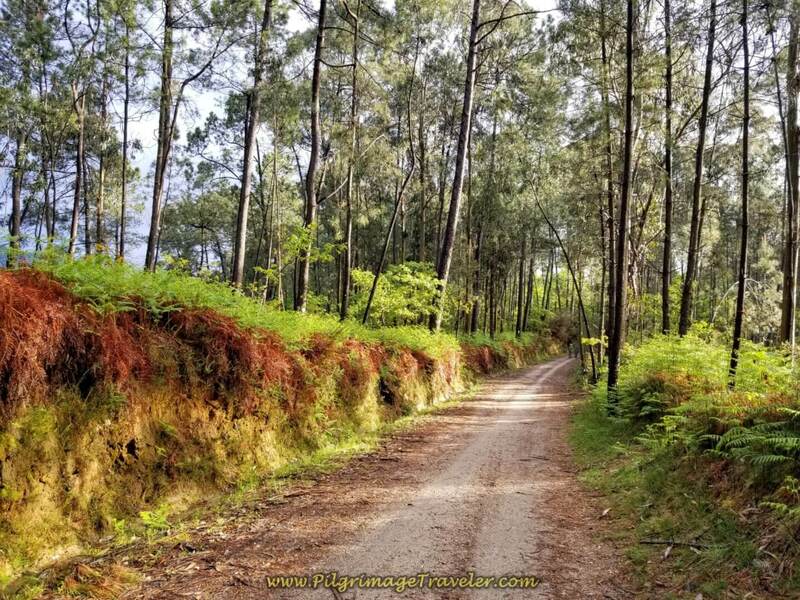 We would walk this route the following day, day fifteen on our Camino Portugués. 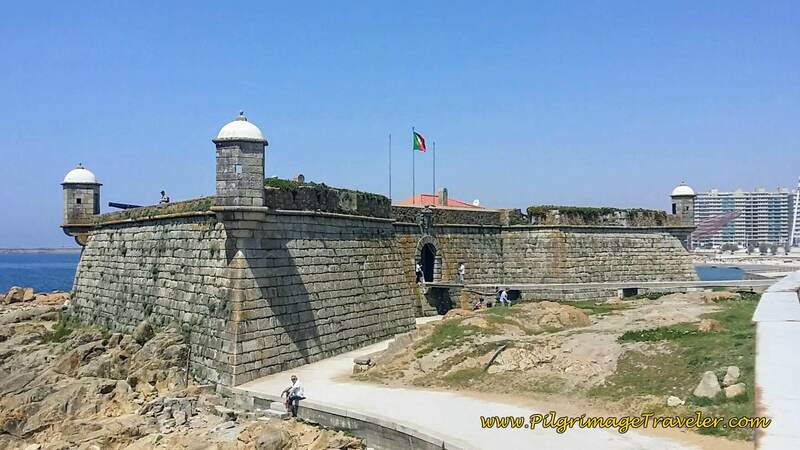 The castle, also known as the Forte de São Francisco Xavier was built in 1661. According to the placard by the castle, 1832 saw its occupation by the Absolutionists, and was badly damaged, then for many years it was unoccupied. 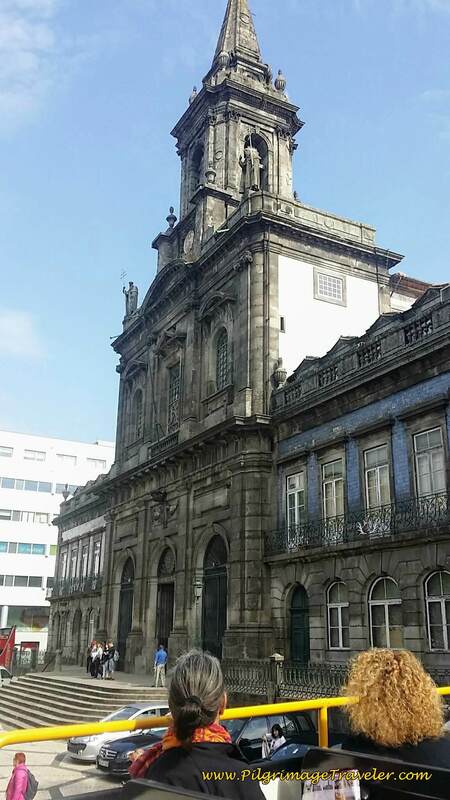 It then became the headquarters of Porto's 1st Company of the Navy. By 1975 it was given to the Northern Commandos Association. I loved the yellow flower so often seen at the seaside, in the photo below. If anyone knows the name of this flower, please inform all of us in the comments below! 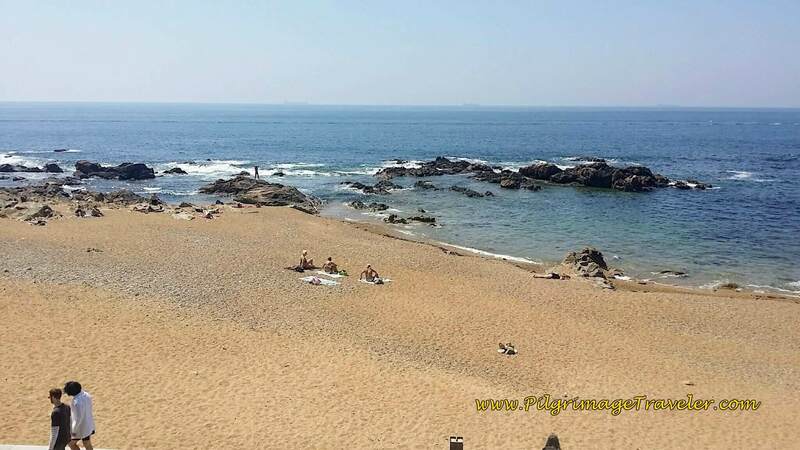 And yes, by the Castelo is a lovely beach, called none other than the Praia (beach) do Castelo do Queijo. In April of 2017 it was definitely already beach weather! 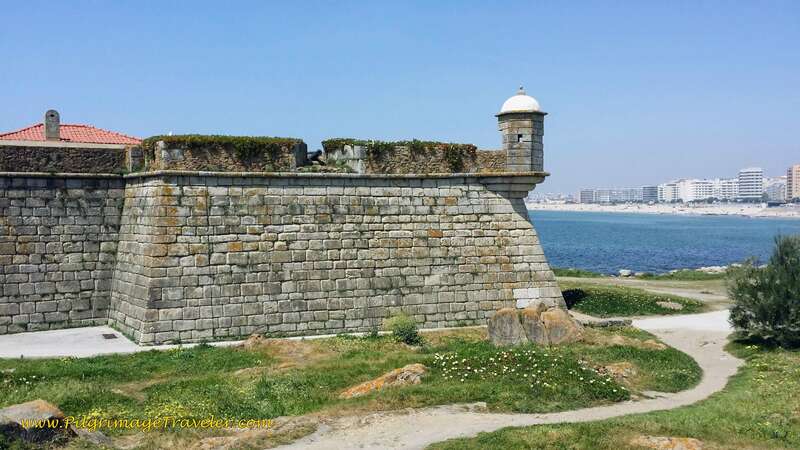 Hoping back onto the tourist bus, the drive along the coast south and east brings you to yet another fort, the Fortaleza de São João da Foz, or St. John's Fort at the Mouth (my loose translation of Portuguese). We did not hop off here, but I snapped a quick photo. 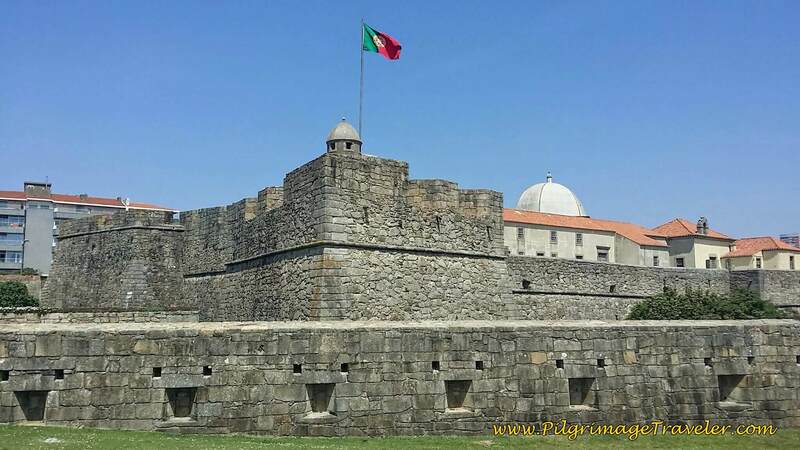 This fort, built in the 16th century guarded the Douro River at the mouth of harbor. 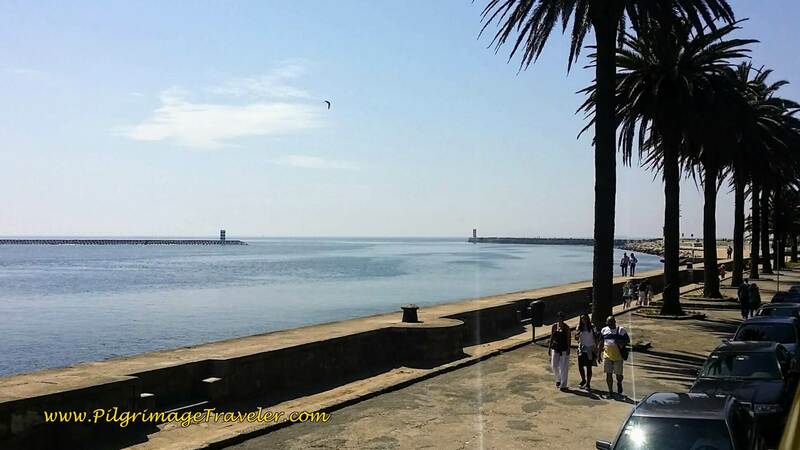 It is a major landmark on the Senda Litoral where the Douro River meets the sea! 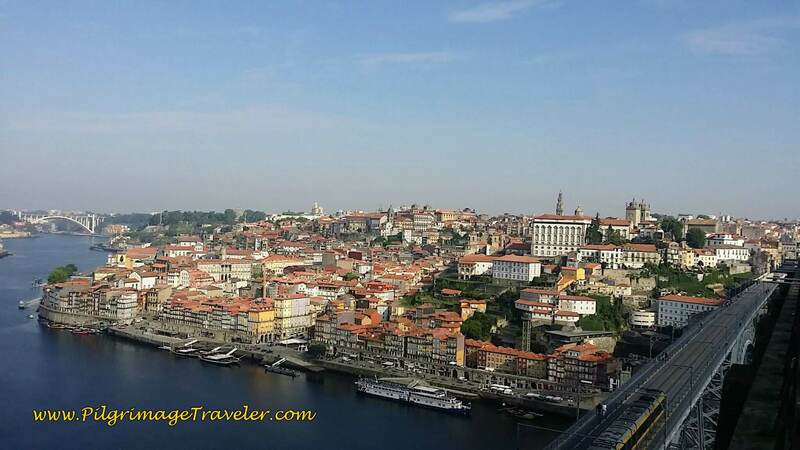 Then the route bends east along the Douro River and back toward the center of Porto. Here is the harbor entrance, just beyond the Fort, (which is around the corner to the right of what is pictured below). 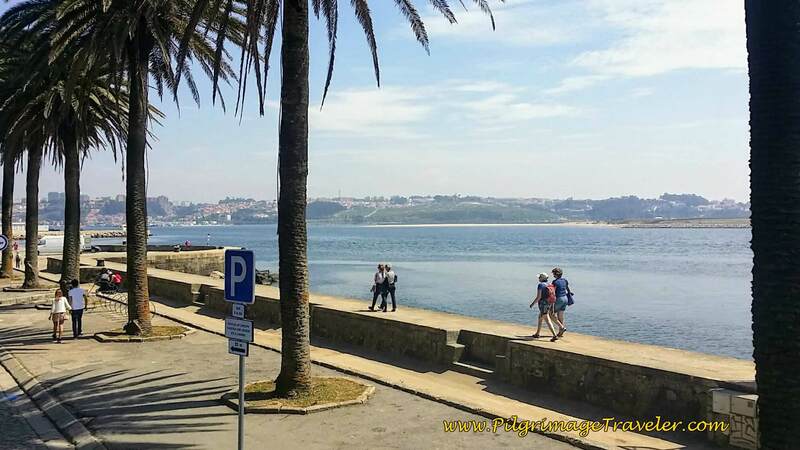 It is along this riverfront promenade that we would begin the second half of our Camino Portugués, along the Senda Litoral. I was very excited to see the Way, the day before, from the upper, open air deck of the Hop On Hop Off bus! 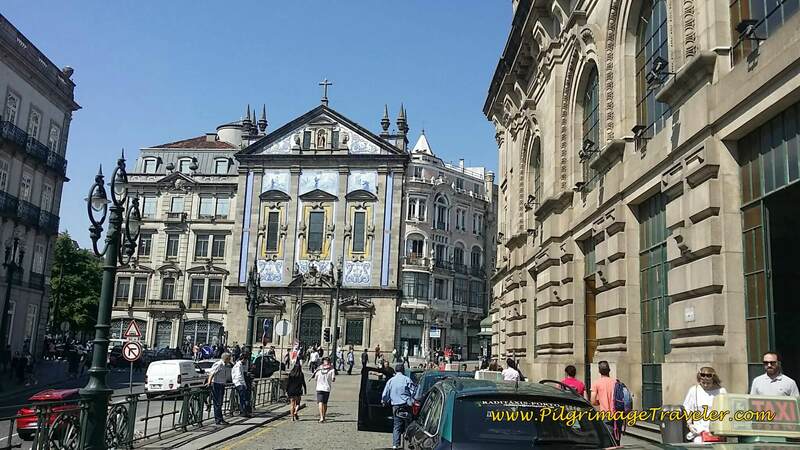 Back in the center of Porto, we hopped off the bus here at the Igreja Monumento de São Francisco, the San Francisco Church where we chose to only walk around the outside and not pay the entrance fee. Just too many churches in one day I guess! 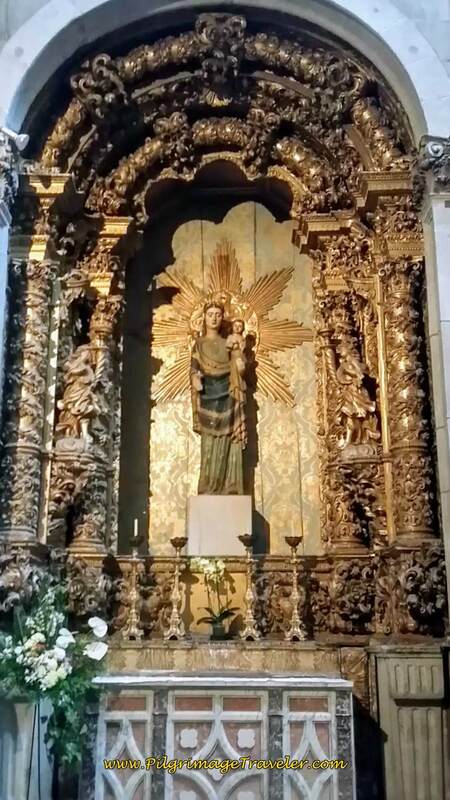 The gilt carvings in this church are fabulous. Click here if you are interested in seeing it. 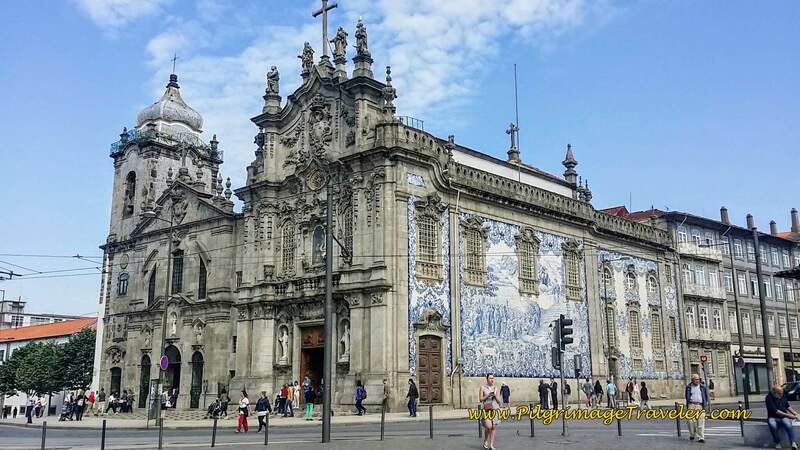 Across the street from the San Francisco church is this little gem, the blue-tiled Igreja Paroquial de São Nicolau. The photo on the left shows it from the upper terrace of the San Francisco church. And beside the churches to the north is the Jardim do Infante Dom Henrique, a small green park with a statue commemorating the man of the same name, known as Prince Henry the Navigator. 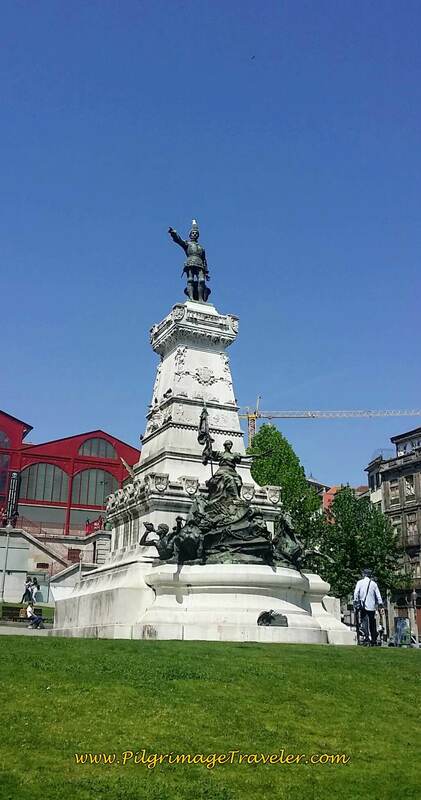 This statue was completed in 1900 and honors the courage and faith of the famous Portuguese navigators. Just beyond the statue, you can see the red buildings of the Ferreira Borges Market where we chose to sit and have a beer instead of touring another monument! Then the beer was followed by a café con leite, to perk us up for the remainder of the day! From the Dom Henrique statue, we opted to walk up the hill towards our final monument for the day, the famous train station with the blue murals. 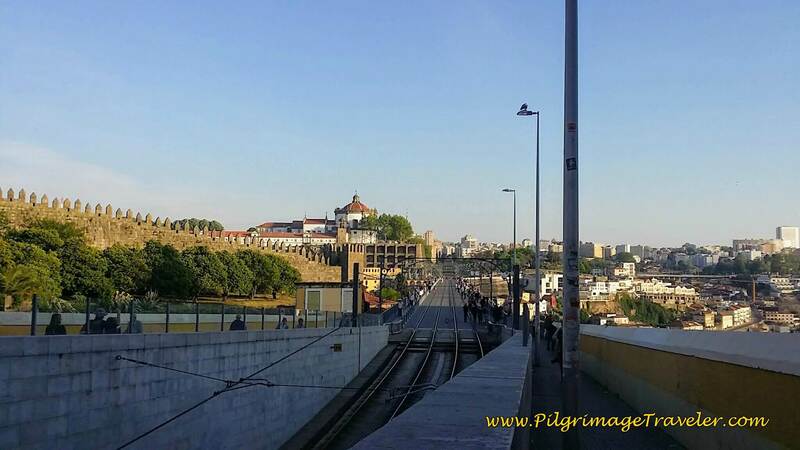 We walked along the Rua de Mouzinho da Silveira, shown to the left side of the photo below with the São Bento metro station in the foreground. This photo was taken from the terrace of the São Bento train station. 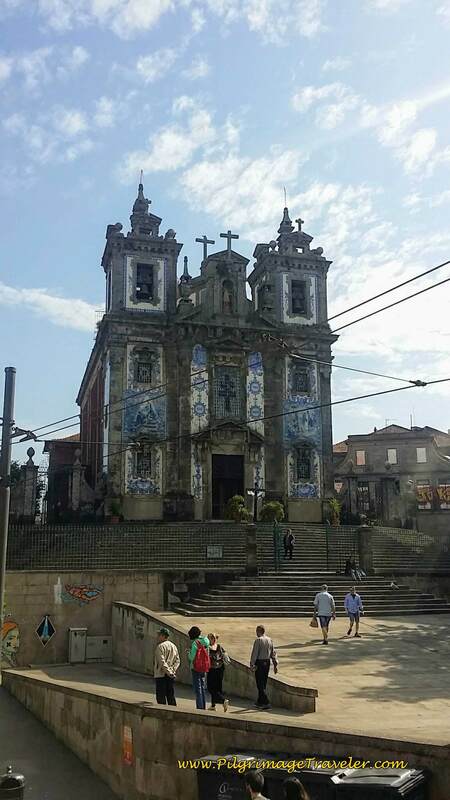 Also from the terrace of the train station on the right side of the photo, below, one can see another blue-tiled Church, the Igreja de Santo Antonio dos Congregados. So many churches, so little time! 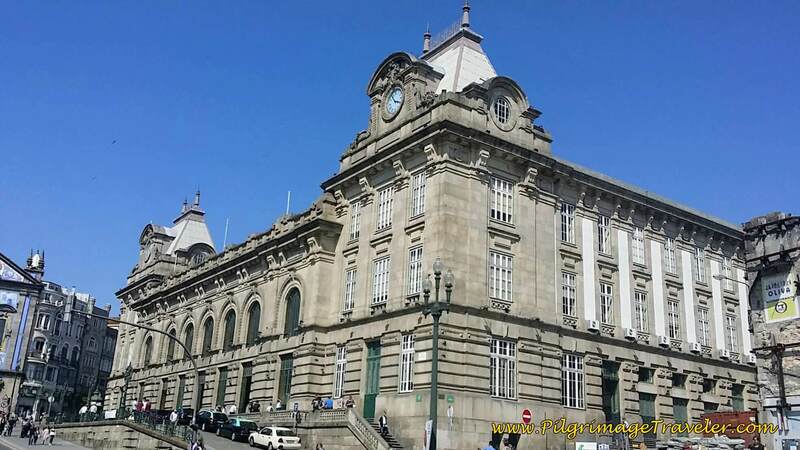 And perhaps, the crowning glory of the day, the Estação São Bento, the famous train station. 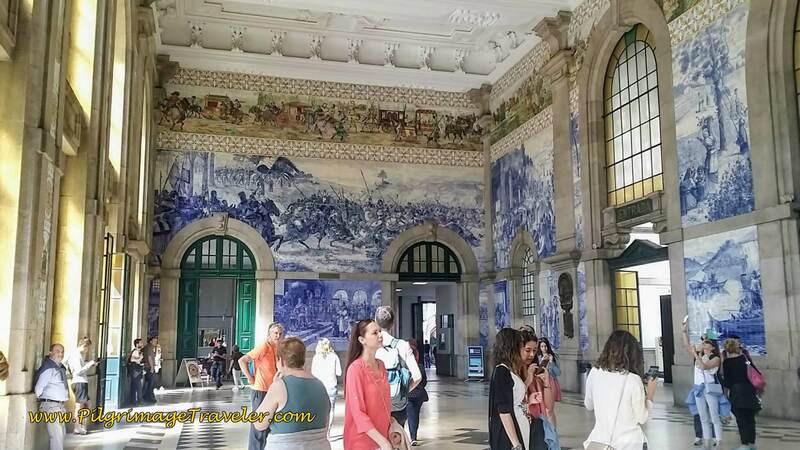 The train station's famous murals depict scenes from Portuguese history, and was inaugurated in 1916. 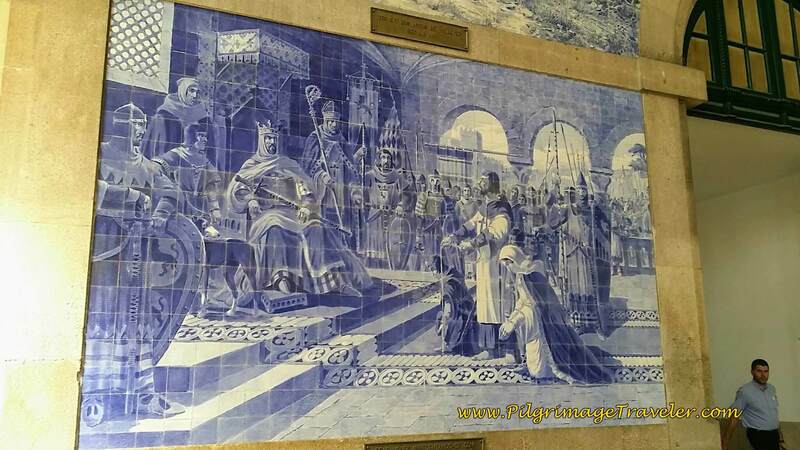 Here is an azulejo mural of the knight Egas Moniz before the king, Alfonso VII of Leon in the 12th century, offering his life, his wife and his sons during the siege of Guimarães. 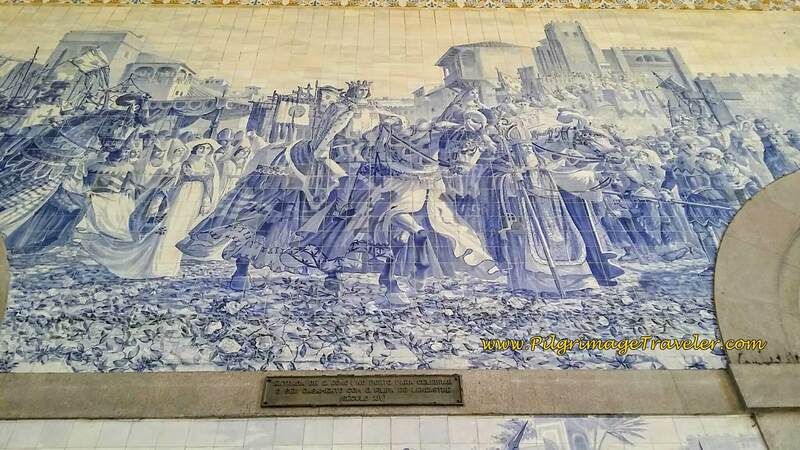 The next mural I show is of the entrance of King John I and Philipa of Lancaster into Porto on horseback, to celebrate their marriage in the 14th century. And finally, after a long day of touring, we wanted to head to the port houses on the south bank of the Douro to conclude our day. 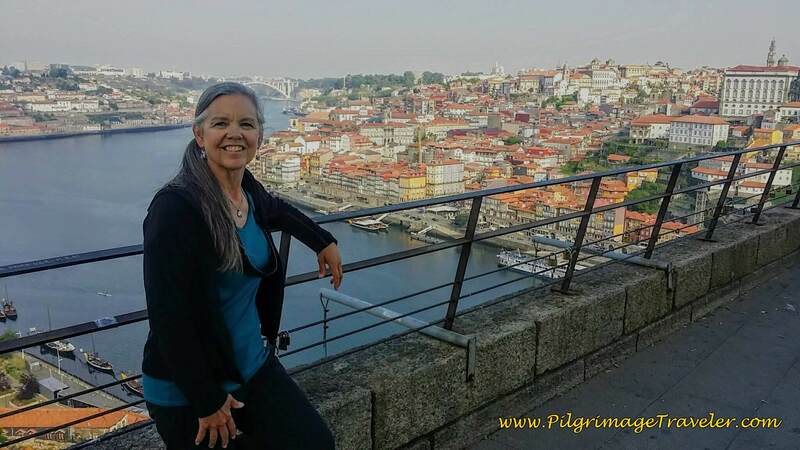 We walked the few kilometers from the train station, back across the Ponte Luiz pedestrian level, and wound our way down from the upper level of the bridge and its look-out, to the lower level of the bridge and the River Douro. 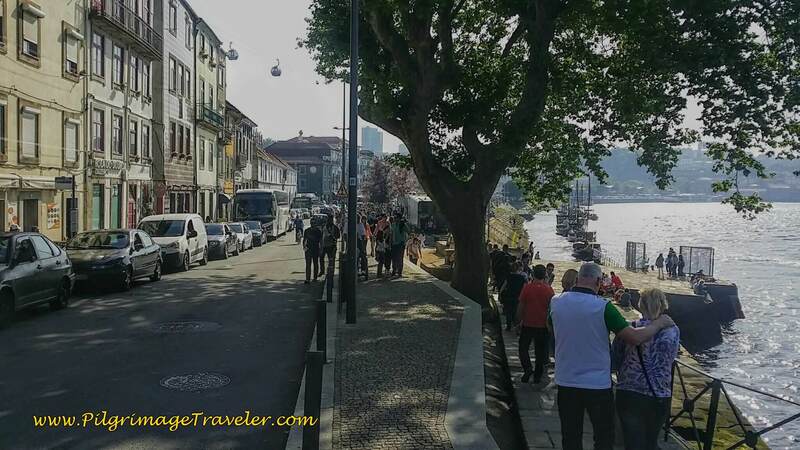 As expected, on a warm sunny Sunday afternoon, the street and promenade along the River Douro were crowded with people. Here is a photo of a typical port winery, the Sandeman. 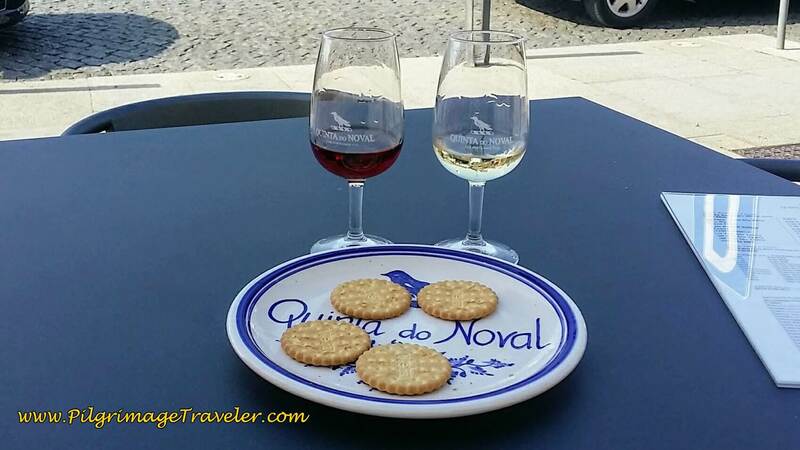 We chose to try out a less crowded port house, and the Quinta do Noval was a mistake! The waitress did her best to get us to try the most expensive port on the menu, about 35 Euros a glass! We chose the cheapest instead, about 5-6 Euros, and got this amount, in the photo below! I guess there was a reason the Sandeman was crowded? However, the port is fabulous, and we imbibed in another restaurant earlier for an almost-as-tasty experience at 1/3rd the price. So chose your port house carefully, unless you have a much more discerning palate than mine! 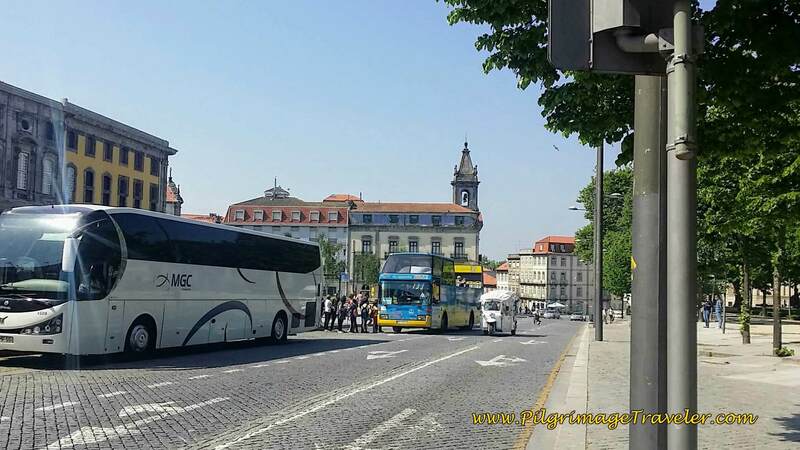 And the final beauty of our day, was the blue line of the Hop On Hop Off bus came right by the Quinta do Noval and took us up the hill to our hotel farther south, in Vila Nova de Gaia. No taxi-ride necessary! I hope your own day(s) in Porto are as fabulous as ours! It was really no break from walking for us at all, but it was a welcome day of luxurious sightseeing. 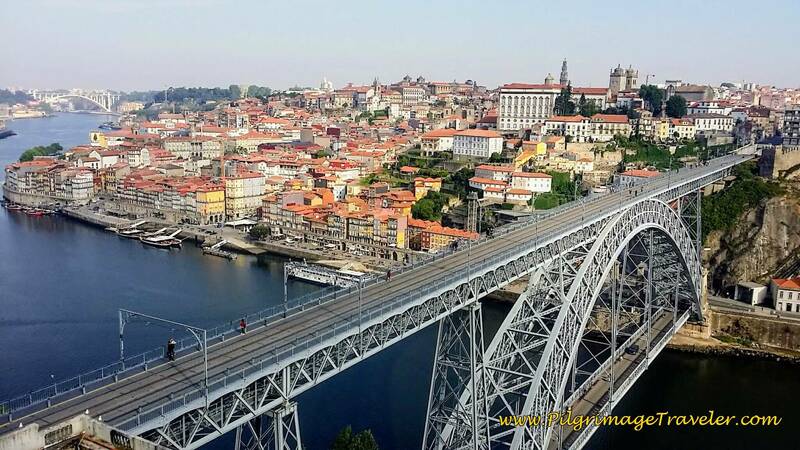 Clearly, you will not be bored in Porto! Indeed there is always somewhere to be, something to do and someone to see!